To view more pictures, interactive maps and the full, detailed description of the Gables at the River Front community, please Login. Overlooking the beautiful James River, the Gables at the Riverfront is a new construction community of both single-family detached and attached homes designed in 4 different floor plans ranging from 1822 sq ft to over 3345 sq ft. This lovely waterfront community will captivate you from the first moment you see the golden sun setting over the Monitor Merrimack Bridge Tunnel. These 3 to 5 bedroom homes are built with low-maintenance exteriors. They come with spacious 2 car garages. Large windows fill the homes with natural light. The various models have options that include first floor screened in porches, sunrooms, or open porches. Some have second floor sitting rooms or finished attics as a flex room or additional bedroom. These homes come with upgraded finishes to include hardwood flooring, tile, granite counters and stainless steel appliances. 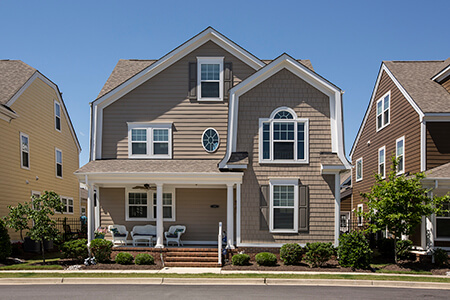 The Gables is located in northern Suffolk, in the sought after area of Harbour View, conveniently located just off of I-664 15 minutes from downtown Norfolk, and 15 minutes from Newport News by way of the Monitor Merrimac Bridge Tunnel. Making your home in the Gables gives you access to the amazing amenities of this upscale neighborhood. There are 2 luxurious pools, a sophisticated clubhouse, tennis court, 18-hole golf course, playgrounds, 43 acre lake and walking/jogging paths to enjoy. The larger area of Harbor View is a growing community with new shopping areas and restaurants. Send me more information about the Gables at the River Front new home community. Our agents gladly offer FREE property tours of Gables at the River Front, Suffolk and homebuyer consultations to all serious buyers. Our Suffolk SH Pro is prepared to represent you and your interests so you can move into your dream home.